This 2018 Bubble Wrap Calendar Will Make Next Year Really Pop! | OhGizmo! 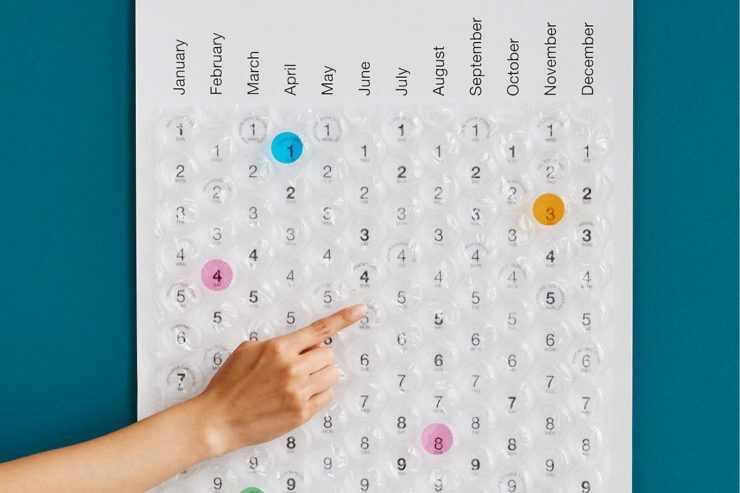 This 2018 Bubble Wrap Calendar Will Make Next Year Really Pop! By Randy Donack on 11/17/17 • Leave a comment! So, the year is coming to an end soon. It sure has been a great one. Well, maybe not great, but hey at least it wasn’t boring. But of course, you’ll need a new calendar soon and what better way to relax in the coming year than with a bubble wrap calendar. It works like any regular calendar, January goes first, and December is last; but this one let’s you pop your days away, which is way more fun than crossing them out with a marker. Of course, the only issue would be resisting the urge to pop more than one day at a time. You could spend a minute popping blindly and accidentally end up erasing August. But then again, the year will fly by so fast anyway, and then before you know it, 2019 is ending, then 2020, then 2021, 2030, 2050, and then…death.